Microsoft gave Windows 8/8.1 users the chance to try out its Windows 10 Technical Preview last week, and now the company is giving people on Windows 7 the chance to do the same. As noted by Winbeta, Microsoft has made the beta available to Windows 7 users signed up to its Windows Insider Program, who can download it by turning on Áutomatic Updates'. To see the Technical Preview in Windows Update, you will need to sign up for a free Microsoft account using an existing email address and use it to join Microsoft's Insider Program. 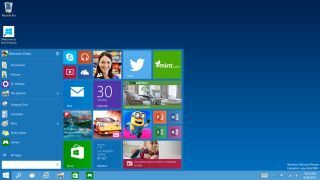 Microsoft has been issuing Windows 8.1 to Windows 8 users for free through Windows Update for some time, and its decision to deliver Windows 10 in the same way raises the question of whether the company will offer its new OS to Windows 7 users for free. Windows 10 has been described as a blend of Windows 7 and Windows 8 as it combines the classic Start Menu of the former with Windows 8's Live Tiles. Microsoft has repeatedly stressed that the beta has been released to give enterprise users a flavour of how it can be used with a keyboard and mouse, and that a touch-oriented consumer-focused released will be made available in 2015. Check our latest coverage of Windows 10 in our dedicated hub.